As I have said it many times before ( I think I am starting to bore you with this! ), tomorrow I am traveling to Canary islands! I am extremely excited about that, because a vacation is truly what I needed right now! I don’t think that I am the only one who thinks that packing can be a true nightmare, that is way I started packing on Wednesday and slowly added thoughtful content to my suitcase! I am traveling with Ryanair and they allow maximum 10kg in the hand baggage and at first when I found it out I was really freaking out, because 10kg is not nearly enough for the things I wanted to take with me! At first I thought that maybe we could take extra luggage, but as the gap between the flights are only 2 hours we might not manage to check in the baggage in time so we said goodbye to that idea! At first I thought I could take my pc with me and blog from Canary islands, but as my computer weighs too much I have decided not to take it with me! 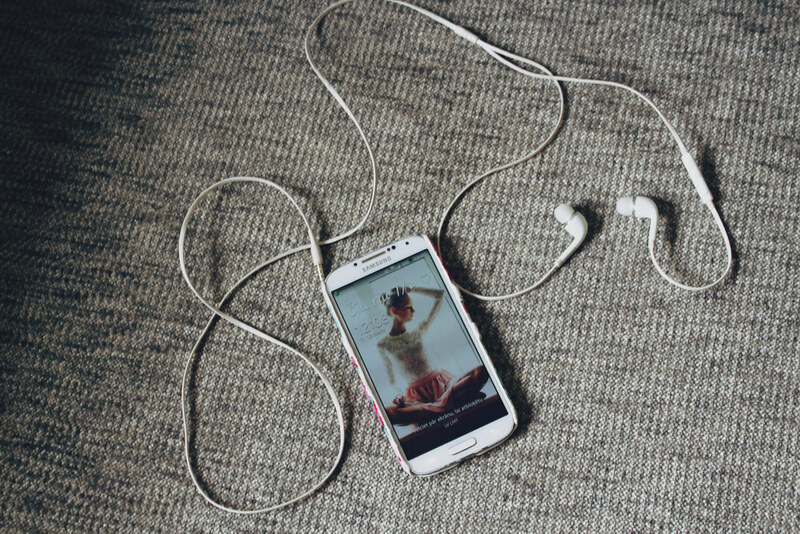 But no worries, I have already scheduled some blog posts for you to read while I am gone (including my Ebay bargains posts which some of you seem really eager to read!) :). 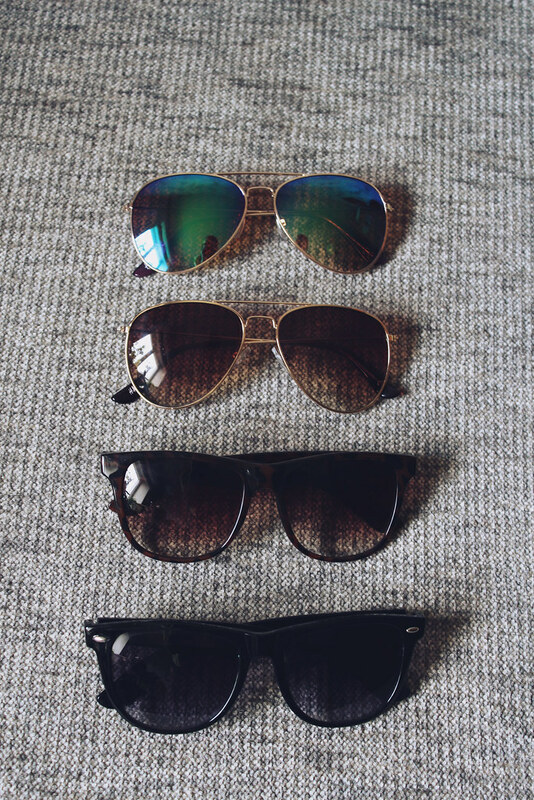 Sunglasses are definitely a must. I mean, I just cannot imagine surviving Canary island sun without having proper eye protection! The aviator type sunglasses are from H&M, and the bottom ones are from Reserved and C&A. And as I am speaking of sunglasses, I have always bought eyewear in store as I thought it could be the only way of how to find out whether the glasses suit or me or not. But that was till I came a cross Bonlook and their program that allows you to virtually try on eyewear before actually making the purchase! I think this is a really great alternative as it saves a lot of time! 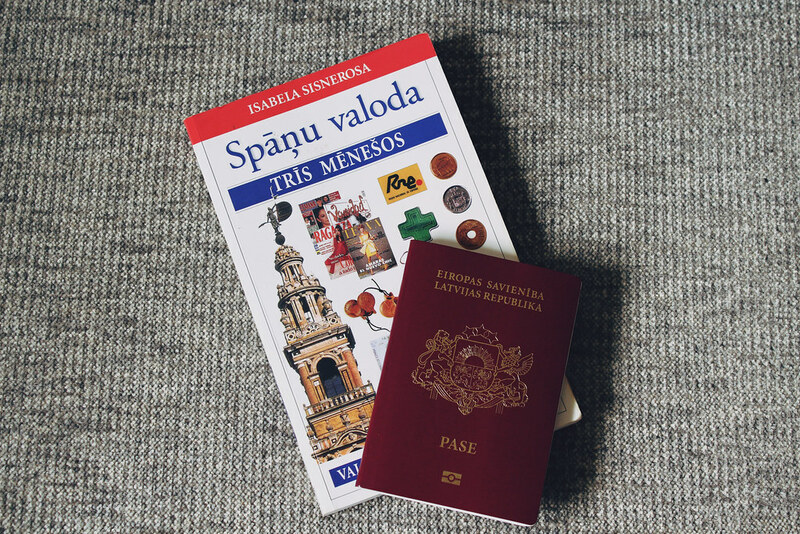 My passport and a book of “Learn Spanish in 3 months”. Even though I have studied Spanish for 3 years, it was about 3 years ago and I haven’t practised Spanish very often since then! So this book is perfect for refreshing my memory! When I am packing I am always trying to visualize my outfits as that way I can avoid taking unnecessary garments that cannot be styled with anything! Because my usual way of thinking fails me as I want to take a lot of things just because they are pretty and I honestly just don’t see the big picture! Some goodies I will take with me courtesy of H&M! These pieces are from their upcoming swimwear and H&M Loves Music collections! The floral print bikini is by far my favorite! You’ll have to help me on this one as I really want to take all four sandals, but if I think about it more- I don’t think it is quite rational to take 4 pairs of the same type shoes! Which ones do you think I should take? I have found out that rolling garments into something similar to tubes is more efficient than folding them as you can pack more items in your suitcase + a lot of times it preserves the garment from wrinkling! 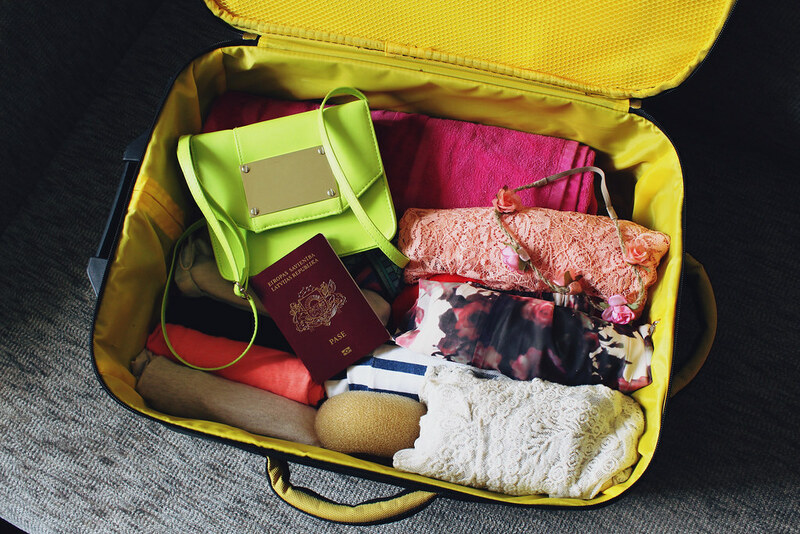 safe travels, and great packing tips. Your floral bikini is so cute! Have fun, pretty! Have a great holiday, Maddie! 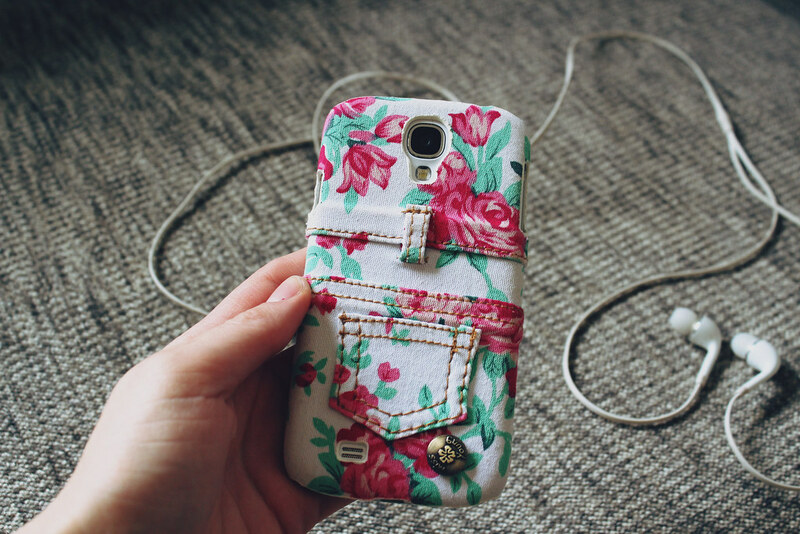 I really love your phone cover! Where did you get that from? I really wnat to get that for myself as well! I really love the outfits that you have packed. have a safe journey! Have a great holiday, hun!! i love the floral print bikini!! You are going to have SO MUCH FUN!! Love the fun colored sandals and all those sunnies! Have a fabulous vacation Maddie! You two are so deserving! You packed beautifully! I like the way you rolled everything. It helps free up so much space! Good for you in not hauling a computer there. ENJOY your vacation! How exciting! I have been to one of the Canary Islands, Fuerteventura and it was gorgeous! What island are you going to? Hope you can fit everything into your luggage! Great essentials! Have fun! You're so lucky! I need a vacay right now too. Have a blast! I love all the fun colors you've packed! I love the swimwears and the shoes! Have fun in the Canary Islands!! I'd take the black sandals because you can probably pair them with anything… and also the green ones because they're so cute! Maddie , you are packing some fabulous clothing! 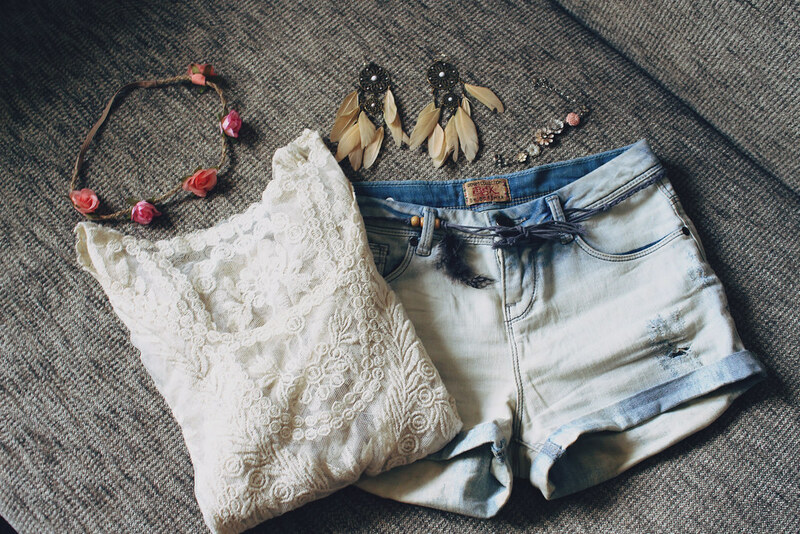 I love your short, the lace tee and the swimwear is so pretty! Love the ruffles. You are very organized. have a wonderful time and enjoy your trip, can't wait to hear about it! So excited for you. I just know this will be so wonderful. Oh yes, rolling is a big help! I love your swimsuits, so cute! It looks like you're a much more efficient packer than me lol. Love the bright yellow sandals, they're too cute. Hope you have fun in the sun! Have a lovely, lovely vacation, babe! 🙂 The Canary Islands are so beautiful!